We hope you’re getting excited for our third annual All-Church Retreat! Below you will find various details about the weekend and our retreat site. We hope this will answer any questions you may have about our time together. 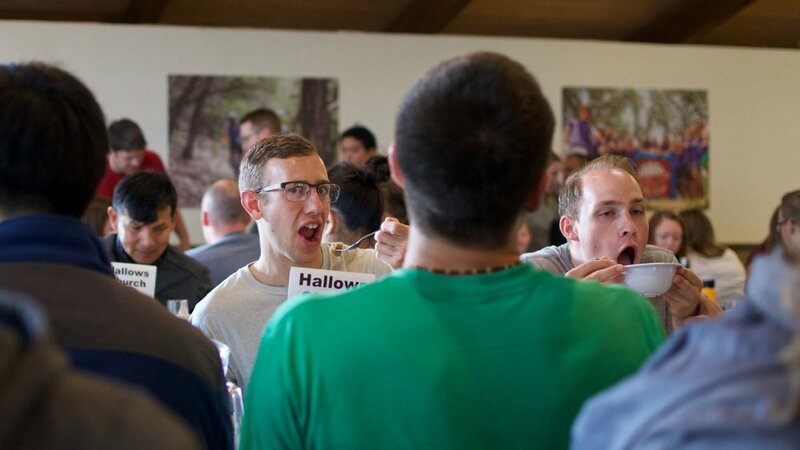 The retreat registration deadline is May 15. Feel free to contact Mary Ann Hudson if you have questions or would like more information (or to check and see if there or any spots available if inquiring after May 15!). All meals will be provided at no additional charge by the retreat center. We will also have coffee, tea, and snacks available during the sessions. We will make every effort to accommodate any food allergies or preferences. Please let us know as soon as possible about any special requests by emailing maryann@hallowschurch.org. So many options this year for our free time! Wander down to the beach area on Lake Whatcom to enjoy waterfront activities (weather dependent) including swimming, water skiing, paddle boats, and sea kayaks. If you prefer to be on land, start up a game of volleyball, Frisbee golf, soccer or basketball. Bellingham also has many great coffee shops, local hikes and kids activities to offer! "The Getaway" will be open throughout free time. This space includes games such as pool and fuseball and is a great place to play board games or just relax indoors. The Firs Retreat Center is located at 4605 Cable Street, Bellingham, WA, 98229 (approximately 1.5 hours from downtown Seattle). *Please remember to adjust travel time if traveling during Friday rush hour. **If you are interested in carpooling, please visit our Group Carpool site to sign up. You can either ADD yourself as a driver, JOIN a carpool, or JOIN the wait list (if no carpools are available). We are excited to offer a kids tract during the main session times! A mission team from Brazos Pointe Fellowship will be providing a wonderful, gospel-centered experience for our kids during the retreat. All volunteers will be background checked by The Hallows Church, and all of our standard policies and procedures will be in place (including check-in and our restroom/diaper changing policy). We will also have a time of (optional) childcare on Saturday afternoon during free time. Hopefully this will allow parents to enjoy some kid-free time with other adults! The entire retreat center is reserved for The Hallows Church and the living spaces are closer together and improved for all life stages this year! All sheets, linens and towels will be provided. Families with children will have a small cabin with a private bath (we will make sure there are enough beds for each person in your family!). Married couples and singles will be in a lodge just next to the cabins. The cost for the weekend is $125 for adults and $50 for children over the age of 3, with a family max of $300. The cost includes food and housing for the weekend. You can register online by following the event link on our homepage of hallowschurch.org. If you need financial assistance, please don’t let it hinder you from enjoying this weekend of teaching, rest, & community. For more info, or if you are willing to contribute towards a scholarship for someone else, please contact maryann@hallowschurch.org for details.